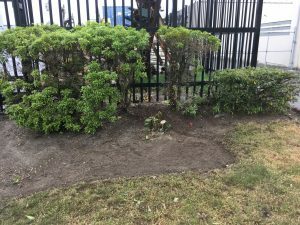 Landscaping and Property Maintenance - How professionals handle low-profile corners - Proper Landscaping Inc. I don’t believe in discrimination. Every part of the landscape should receive attention. Unfortunately, landscape companies are busy and often low-profile areas get less attention or worse, they get ignored. But that’s not my style. This ugly corner was on my list for weeks and I finally got to it. The most obvious blemish is the dead dogwood in the middle. 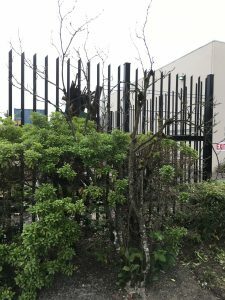 The last thing you want on your site is dead plants. So I did the most economical thing available; I flush cut it as low as I could. The entire bed was overrun with prickly bramble (Rubus armeniacus) which just spreads so I cut it at ground level knowing that this will be a fight until I actually dig it up. Next came light hand pruning of the Pieris japonica shrub followed by raking and weeding. It’s not exactly a beautiful garden spot that would inspire young lovers but the whole corner looks much better and I could take it off my mind. This is the finished product. 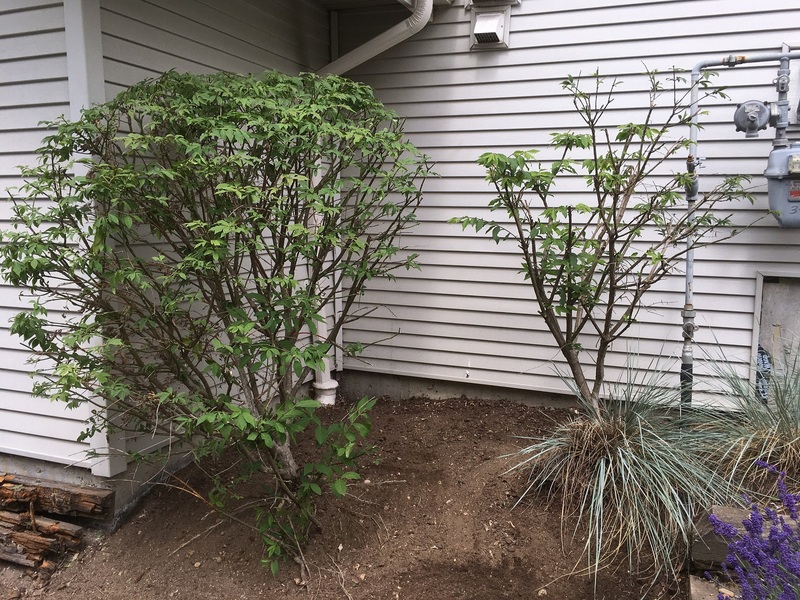 A crew came through and they pruned the Euonymus alatus shrub on the left. Great. If you like average, that is. 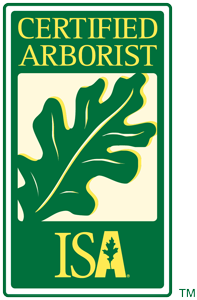 So what would a landscape professional do? What would you do? 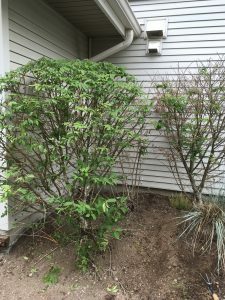 One, there is still debris on top of the shrub and, unless it’s removed, it will turn brown and make the whole shrub look unsightly. Always check plant tops when pruning. Two, there is a dead shrub in the corner and no wonder. It’s planted under a double under hang so it doesn’t get much water. So why keep it? Remove it. 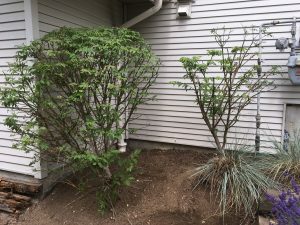 Three, the shrub on the right has lots of dead in it so I pruned out most of it. I probably should have power sheared it. Four, there are obvious weeds like snapweed (Cardamine oligosperma) which snap when they are mature and shoot out seeds everywhere. It’s a bad idea to let weeds produce seeds. The corner should have been weeded right away after pruning. The photo above shows the finished product. There are two spikes still visible on top of the right shrub but overall it is much cleaner. Unfortunately, it took two service visits to get it to this condition. As the workers gain experience they too will be able to read the landscape better and give all corners the attention they deserve.